After fame and fortune left the world-famous vaudeville comedy team of Stan Laurel and Oliver Hardy far behind, they embarked on a career-concluding tour of Great Britain. A brief prologue introduces the duo making Way Out West (1937). Flash-forward to 1953, when they’re desperately trying to attract audiences, trotting out classic routines, playing to half-empty music halls in the hinterlands before winding up on London’s West End, eager to secure financing for a new Robin Hood spoof, titled Rob ‘Em Good. Disgruntled but not discouraged, they turn to public relations stunts to sell tickets. In addition to Hardy’s persistent health problems, they’re constantly bickering, dredging up old grievances. The eventual arrival of their respective wives – domineering Ida Laurel (Nina Arianda) and doting Lucille Hardy (Shirley Henderson) – only makes the situation worse as it becomes painfully obvious that, while these funnymen can’t live with each other, they can’t live without each other. Oozing authenticity, it’s based on A.J. Marriot’s “Laurel & Hardy: The British Tours” adapted by Jeff Pope as a poignant character study that’s confidently directed by Jon S. Baird. IF you want to know more, the 10-disc DVD “Laurel & Hardy: The Essential Collection,” compiling almost all of their sound-era shorts & features (1929-1940), is a treasure trove. 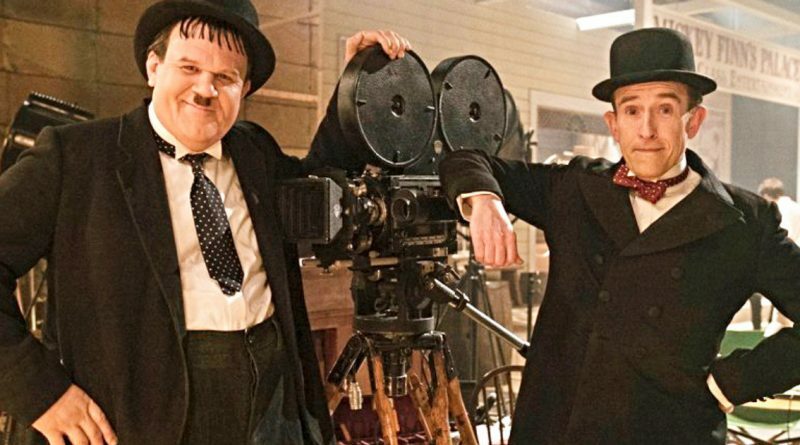 On the Granger Movie Gauge of 1 to 10, “Stan & Ollie” is a bittersweet 7, recalling slapstick comedy long before Abbott & Costello and Martin & Lewis.